The Bumper is a hemisphere of soft rubber which can be stuck to a bench top and makes light work of breaking up and shaking the test gel of MicrobMonitor2 and enables the test sample to be uniformly mixed into the test with minimal effort. 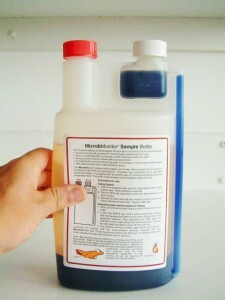 Chlorine release tablets for decontamination of used MicrobMonitor2 and other tests before disposal. Note: Chlorine release tablets cannot currently be supplied to the USA. Fuel resistant, sterile, individually wrapped loops for dispensing 0.01 ml of water into MicrobMonitor and other test kits. Fuel resistant, sterile, individually wrapped syringes for dispensing 0.1 ml to 1 ml of fuel or water into MicrobMonitor and other test kits. The measuring syringes are needle-less and therefore non-hazardous. A 1 litre, twin neck, fuel resistant, sterile bottle, supplied with an alcohol wipe for sample point sanitization. The bottle has a side siphon and separate chamber to enable easy separation of water phase from under fuel phase. The Sampling Bottle has been designed to make fuel sampling quick and easy. It enables sample point cleaning / sanitization and trouble free separation of fuel and water to allow the testing of both fuel and water phases. Any water in a fuel sample settles to the bottom of the sample bottle and is then squeezed up a side siphon into a separate small chamber. Fuel resistant to prevent leaks. Sterile to ensure sample integrity and prevent microbial contamination from the bottle. Easy separation and access to water phase. What tests would I use the Bumber with? MicrobMonitor2 is the only test that would benefit from a bumper, its not a requirement to use the test but if you are a user conducting large numbers of MicrobMonitor2 tests then the bumper makes light work of the shaking part of the test procedure. What are chlorine release tablets used for? Any test kit which grows Microbes inside it should be disposed of in accordance with the manufactures instructions. These will usually advise incineration or sterilisation prior to disposal to ensure any microbes are killed during or before disposal. Chlorine release pills provide an easy convenient source of free chlorine which can be used to sterilise MicrobMonitor2 tests before disposal. What are Sterile Loop dispensers used for? MicrobMonitor2 tests in packs of 5 tests are supplied with sterile 10µl (0.01ml) measuring loops. Bulk packs of MicrobMonitor2 are available with and with out measuring ancillaries. We provide the loops separately to allow customers to purchase the ancillaries as separate items and make savings where possible. The sterile measuring loops can be used to measure 10µl (0.01ml) of sample for any other application. What are the 1 ml Sterile Loop dispensers used for? 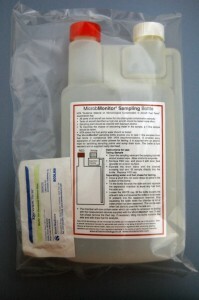 MicrobMonitor2 tests in packs of 5 tests are supplied with sterile 1ml measuring syringes. Bulk packs of MicrobMonitor2 are available with and with out measuring ancillaries. We provide the syringes separately to allow customers to purchase the ancillaries as separate items and make savings where possible. 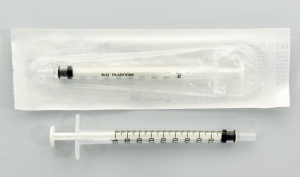 The sterile 1ml syringe can be used to measure between 0.1ml and 1ml of sample for any other application.